Honda of Gainesville has your Passport; the 2019 Honda Passport. Built for the outdoors, your adventure awaits in comfort, with power and total safety. This is the crossover SUV the future promised you, and you can get it today! The 2019 Honda Passport is available now for lease or purchase at Honda of Gainesville. Stop by for a test drive – once you do, you’ll want to take it home. Your all-new 2019 Honda Passport comes equipped with Intelligent Traction Management System, which automatically switches modes when road conditions change. The Passport’s base i-VTEC® V-6 engine, and available i-VTM4™ AWD system, will help you power and navigate on any terrain. More importantly, the Passport’s 4-wheel independent suspension and 9-speed transmission offer a remarkably smooth ride. Oh, the places you will go with your 2019 Honda Passport. You’ll always stay connected with the available Honda Satellite-Linked Navigation System™. You’ll marvel at the driver-centric controls. Your passengers will love the comfortable seats. However, everyone will just adore how much stuff you can fit with almost 78 cu.-ft. of storage space. Comfort, total entertainment, leather seats, a premium sound system, a panoramic sunroof and more await you in the 2019 Honda Passport. √ Up To 5,000 Lbs. Towing Capacity. The first rule of adventuring is always to stay safe and Honda has you covered. Standard on every Passport trim is Honda Sensing®, a suite of safety and driver assistive technologies designed to alert you to the things you might miss while driving. Nothing is more important to Honda of Gainesville and Honda USA than your safety. We want you to have fun with your Passport, but we want you to do it with the full confidence that Honda has your back. Don’t delay! Get your Honda Passport today. There’s never been a better time to enjoy the SUV crossover of the future. Browse Our Inventory and take advantage of our low prices, outstanding customer service, and all the benefits of being a Honda owner. 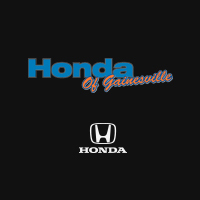 Your adventure awaits at Honda of Gainesville.